Jack's Opinion: Google+ the new Facebook? Google launched a few weeks ago google+ which is yet not open for public only for invitations. However everybody who has a google+ account can invite others. Google+ got already 10,000,000 users in only 2 weeks. Allen (unrelated to the Microsoft founder), is a serial entrepreneur who previously founded the website Ancestry.com and is now the chief financial officer of FamilyLink. He has taken an interest in estimating the Google Plus user count and calls himself an unofficial Google Plus statistician on his Google Plus profile. He has been estimating the Google Plus growth rate by comparing the number of names on Google Plus to the number of names in the 2000 U.S. Census. If he is correct than Google+ will approximate reach 200,000,000 users in 12 months. Which would be the fastest growing social network ever. Which might be possible especially that google wants to build google+ into their Android OS, then within a short period 33% of US smart phone owners would have google plus. Or around 24% worldwide. Within one major update google could have over 100 million users for their social network. Now, just having google plus on the phone does not mean we are using it, but if google does integrate gmail, google docs, google music etc into google plus then almost all android users will use more or less google plus. How much trouble is google plus for Facebook? A lot. Of course right now google plus is very limited, no games or apps to install and as we know most users like to play games in their social network? Or do they not? Yes for FB it was one of the most important reason why it could grow so big. But maybe we are in the post social game network, that google does not need to have games and people still use it to read and post. Google might have missed the first social network train 4 years ago but I think the timing is now right. 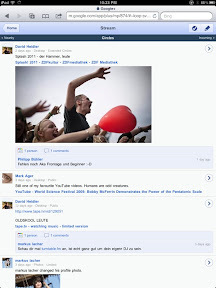 Two years go when Facebook exploded (second train or phase) google would have not any chance. But now it has a very big chance to pass FB in less than two years. Google has everything Facebook does not and what Facebook has since a few months and what will come is not really wished by the users. Facebook grew but the revenue needs to grow too, as a result there are more and more annoying ads on FB. Ads are on the right side, ads are in your walls and ads are everywhere and many times even not clearly marked as ads. Users don't like this. On the other hand google has video service, video group call and music service. If video (YouTube) and music (google music beta) are integrated in google plus then google+ is the one stop portal for everything from search over email, listen to music and social interaction. Right now Google does it with a top navigation. Whenever you are logged into your gmail account and on a google page you will see on top all services like google plus. And then there are the privacy settings and circles for groups which are handled much better than groups or privacy settings on Facebook. Facebook is right now a little in trouble, losing in the UK and US members. Facebook should have bought myspace to get the entertainment industry but they missed. And then Facebook missed mobile and took too long to get on this, google owns 30% of mobile. But the biggest advantage for google is that google plus has no ads and does not need to have ads for a long time. Long enough to attract many users. Google makes already a lot of revenue with their search engine. Google plus helps google to sell better targeted ads to their search engine. It is a perfect synergy. We will use google plus for social and have no ads, and other the other hand google gets enough info about us and our social behavior that they can optimize the search results and the ads placed on the search page. I am not the biggest Google fan neither I am a Facebook fan but I am on both and I might skip FB when enough friends are on Google. If google does stay away from ads on google plus and keeps the privacy settings as transparent as they are right now, then I believe Google has a big chance. There are few things I don't like on google plus, but I am sure they will make changes till it is official released. Google is trying to combine twitter and Facebook. Therefore people can follow/add me without I know. I can see who is following me but there is no accept request for following. Under notification you can see who added you and there you can block or hide these people. But you have to be pro active to do so. Last week I got tons of emails from google because of a problem with their notification server. The server was not scaled for the high amount of users and the hard drive got full. As a result same emails went out 20 to 50 times. Using google plus on the iPad will always start as mobile version which looks odd on a big screen. You have manually switch to desktop and it switches all the rime back to mobile when you click on links, this is annoying. Companies should offer three choices. Desktop, mobile and tablet, this would be perfect. Let us see how google plus is growing the next 6 months. I think between month 4 and 6 will define if google will really take off or die as some other promising google projects.